Having the option to dim the lights is no longer a massive luxury, Direct Trade Supplies stock a wide variety of metal low profile dimmers reflecting an array of different styles, functions and quality grades. 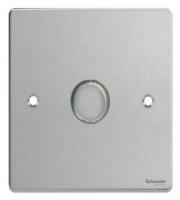 We stock dimmer switches made by some of the leading names in the electrical switch and socket market, these include the likes of Schneider Electric, LightwaveRF and Hager. 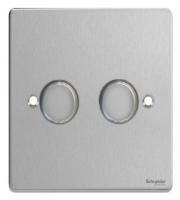 Metal low profile dimmers are used to create a subtle and intricate appearance on your walls. 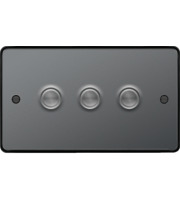 Low profile switches are much sleeker than ordinary switches which can often look blocky and bulky once installed onto the surface. 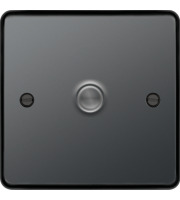 For the greatest aesthetics a low profile switch and socket system is often installed when image is key. 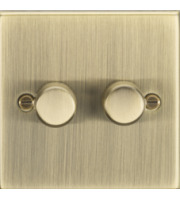 With lighting systems constantly advancing and technology improving every year the use of dimmer switches is on the rise. There are so many scenarios where using dimmable lighting can help to reduce or increase the feeling inside the room. 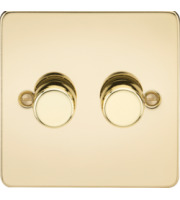 Being able to dim the lights in time for a film in the evening can help to create a cosy atmosphere. 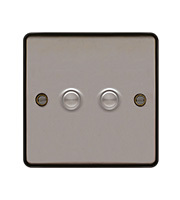 Alternatively, if you need extra light in the room then a dimmer switch can be turned up to aid the visibility whilst studying or reading. 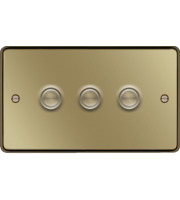 Within our low profile dimmer switch selection you can discover a whole host of styles and finishes. 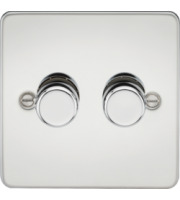 Within our Schneider dimmer switch section you’ll find some beautiful polished chrome models, whereas Hager have polished brass and black nickel, LightwaveRF switches have some stunning models available including black, chrome and stainless steel finishes. 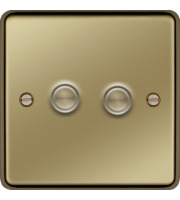 The sheer choice of designs and styles can help any office or household select the best dimmer switch for them, many can be matched up with similar sockets and other electrical accessories made by the brand names. 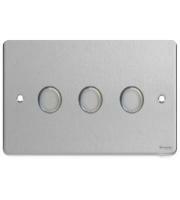 Direct Trade Supplies are keen to provide our customers with all the latest electrical accessories to hit the market. We are in constant communication with some of the best leading brand names and have a great relationship with all of our staple electrical brands. This means that when new and exclusive ranges are launched onto the market, Direct Trade Supplies are more than likely there to stock them. 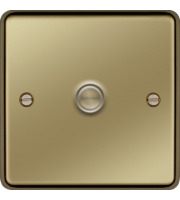 So whether you are looking for new exciting electrical accessories or you have your eyes on an older more established range, take a browse through our selection of dimmer switches and electrical accessories to see if we can provide you an item best suited for you, your home or work.